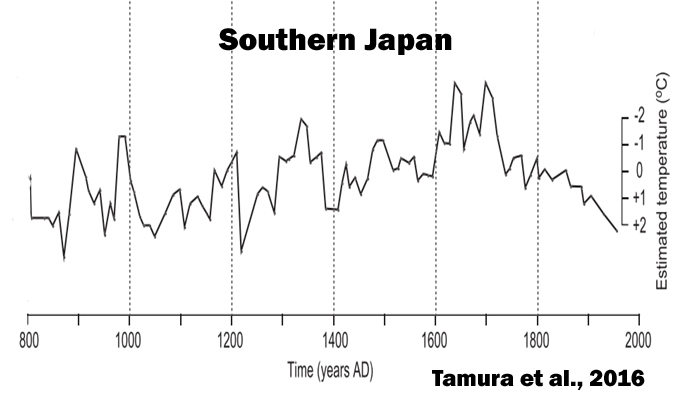 Near Record Cold Grips Tokyo, Far East …And Typhoons Trending Downward Since 1951! 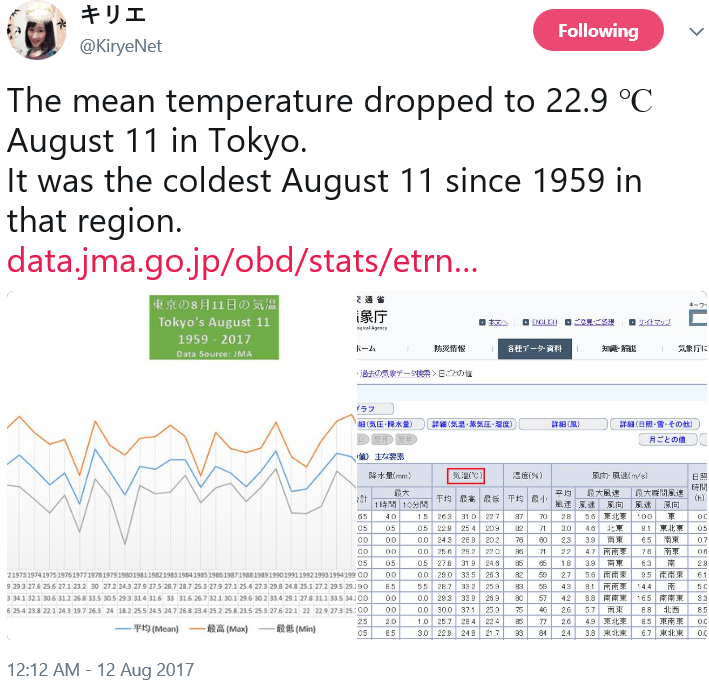 Browse: Home / 2017 / August / 12 / Near Record Cold Grips Tokyo, Far East …And Typhoons Trending Downward Since 1951! And here I don’t mean the frosty atmosphere created by fat boy, Big Kim in NoKo. Not only Japan, Western Europe and USA are seeing cold weather, but New Zealand as well has been having unusually cold weather. According to the sott.net here, “New Zealand is currently experiencing its coldest winter since 2009” as the island country has been hit by heavy rainfall. Kirye also brought up another interesting fact which once again contradicts all the climate alarmism hysteria. According to the Japanese Meteorological Association (JMA), the number of typhoons since 1951 has been trending DOWNWARD. You can view a much better image here. Meanwhile the number of typhoon landings for Japan is dead flat. There’s been no change despite the rise in atmospheric CO2 concentration. The above graph shows the number of hurricanes that formed in the North Atlantic Ocean each year from 1878 to 2015, along with the number that made landfall in the United States. The orange curve shows how the total count in the green curve can be adjusted to attempt to account for the lack of aircraft and satellite observations in early years. All three curves have been smoothed using a five-year average, plotted at the middle year. The most recent average (2011–2015) is plotted at 2013. Source: here. 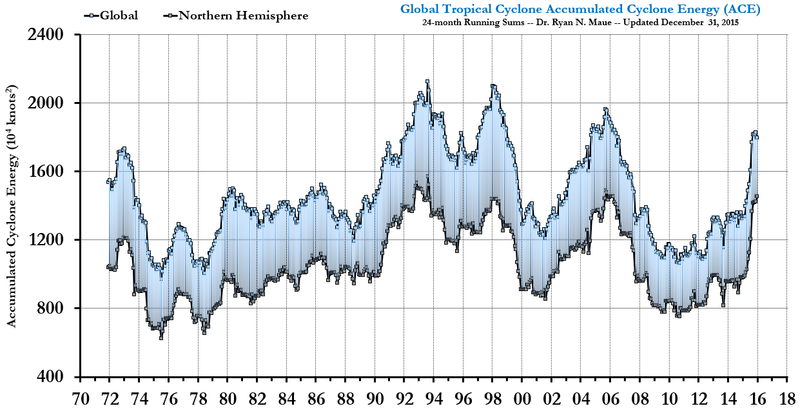 Seasonal global accumulated cyclone energy (ACE) from 1972 – 2015. Black dots are for the Northern Hemisphere only. Each dot represents a 24 month running sum. Source of chart: Atmo 336. If anything, the trend for the past 25 years has been significantly downward. Overall this all tells us that cyclone activity is linked far more to ocean cycles than to trace greenhouse gases – and is so by one or two orders of magnitude. Perhaps some parts of New Zealand have been cold. Where I live in the North Island, we have only had two frosts. Mostly it has been raining. When winters here are not so cold they are very wet. In fact where I live it has been very wet for five seasons without letting up. I live in New Zealand,and can assure you we had a cold summer. Very little swimming in the sea,as too cold. Gardens suffered from being too cold and wet. not summer, which for us was cool and very wet. Just had a very cold time in Melbourne last week…. The thermometer hovered around 4-9C for 7days. There were large dumps of snow in the Victorian Alps. I was pleased to return to NZ where Spring is on the way. My region (Gisborne) has had its wettest year in 73 years. Isn’t she the same one who called out DMI for their “corrections” to the arctic sea ice record? Nice to see Japan has kids who know how to think, and aren’t afraid to expose the frauds. Here are Japanese temperatures since 1998. 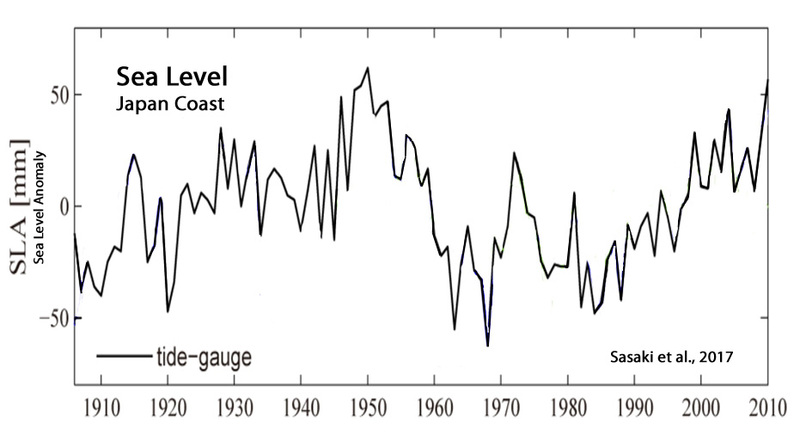 And here are Japan’s long-term temperatures and sea level rise rates. 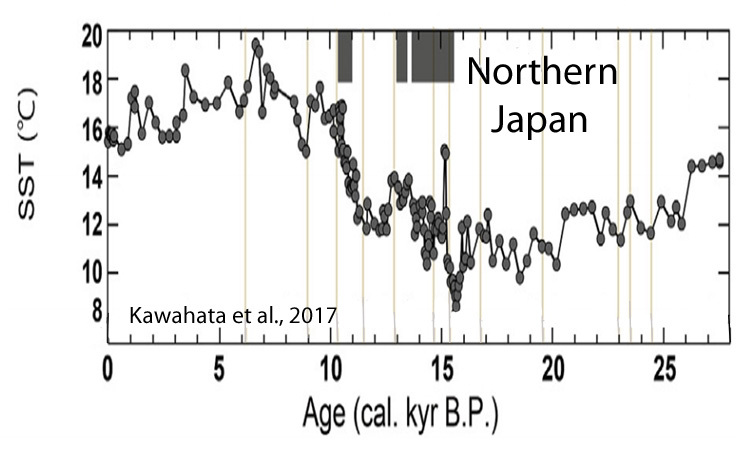 Temperatures in Japan flatlined for 18 years 5 months before receiving the spike from the latest El Niño. I reckon that about 20 years flat trend will soon be restored as the influence of the latest El Niño ends. There was then a slight step up, which is common in several data sets from the Asia region, then, as you say, around 18+ years of a further zero trend. Thanks for your reply. We are on the same page. In any case, we would have seen another picture if scientist removed the warming effect of the urban heat island. According to Ph.D. Jyunsai kondo, A professor emderitus at Tohoku University, 17 stations which the Meteorological Agency adopts as standard temperature of Japan have problems ambient environment. Besides, “only three stations are reliable including stations except that 17 stations in Japan.”, He said. Right. My understanding is that they adjust non-urban environment temperature results to match the UHI, and the climate models. I don’t know how they rationalize committing such blatant fraud, or how they are able to sleep at night. Mustn’t have a conscience, I guess. OT, but this is interesting. Being the gruniad, they did of course, have to give a plug to the all powerful “climate change” somehow. Also (slightly) OT, and also interesting. Seb has nothing to counter this, eh? Anyone remember this delusional cretin? Pen Hadlow, the British “explorer” who was going to sail to the North Pole to highlight the effects of climate change. Apparently there’s too much ice. 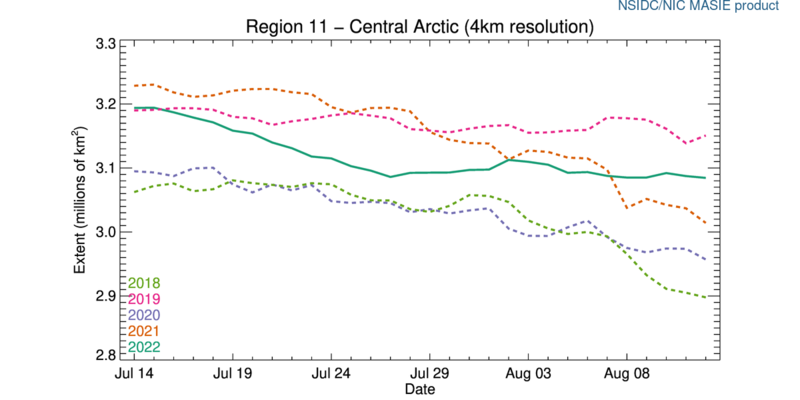 Central Arctic is barely letting at all.